More than 60 classic cars battled their way between Land’s End and John O’Groats on this year LeJog endurance rally, which is being described as the toughest ever. “The weather gave enough challenges to the competitors but without being too appalling – it was slippery but road conditions were good enough to allow us to carry on with the tests and trials without having to cancel any section”. Drivers set off from Land’s End on Saturday 1st December on an epic 1,400 mile route across Britain, travelling through Cornwall, Devon, Somerset, Wales, Shropshire, Cheshire, Lancashire, North Yorkshire, Northumbria, Northumberland, East Lothian, West Lothian, North Lanarkshire, and across Scotland to arrive in John O’Groats after a four day period of tough rallying. 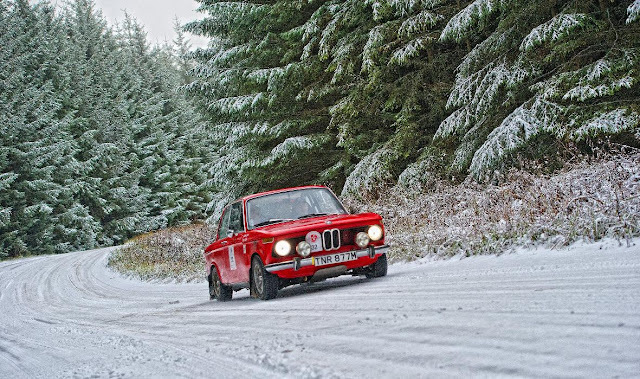 The winners of the elusive gold medal of this year’s LeJog were Andy Lane from Saddleworth and FIA Champion Navigator Iain Tullie from Cumbria, who came first in their 1973 BMW 2002 Tii. The “Team Triumph”, formed by driver Tony Sheach from Fleet, Hampshire, and navigator Richard Lambley from Slough, Berkshire, finished in second place in their 1964 Triumph TR4. Tony Sheach also won the Test Pilot Award as he had the best overall performance on the tests. LeJog served as the fourth and final qualifying round of the much coveted HERO Cup, which went to father and son team from Bolton, Michael Baker and Simon Baker. During the year, the Bakers were the crew with the overall highest score, having driven their 1978 Porsche 911 SC to 3rd place in the Scottish Malts and 2nd in the Summer Trial. A variety, built before 1984, took part including a 1957 MGA coupe driven by Curt Wagner and Horst Pokroppa, a 1965 Mercedes-Benz 230 SL driven by Jochen Gabriel and Onder Turker and a 1974 Datzun 240 Z driven by Riccardo Moraldi and Pietro Turrinelli, amongst others including BMWs, Alfa Romeos, Triumphs and Porsches. HERO supported the Whyte Sisters, Seren (23) and Elise (21), who tackled LeJog to raise funds for the Pink Ribbon Foundation in a 1964 Mini Cooper S provided by HERO Arrive & Drive. The Sisters were also the youngest female crew to compete ever. LeJog was supported by AVIS, exclusive support vehicle partners of HERO Events and Orianda (www.orianda1937.com), who sponsor the first prize of the HERO Cup by offering a week sailing in the Mediterranean on board this splendid yacht. Every competitor dreamed of collecting one of the elusive gold medals, but crossing the finishing line was the main aim of many, particularly novices. The sense of achievement is immense and most crews passed under the finish banner with huge smiles on their faces.